Anders Dahlblom (b. 1974) has been appointed as member of the Board of Nordkalk, a portfolio company of Rettig Group. In May we published the appointments of two other new Board members: João Ney Colagrossi and Raimo Lind. Anders Dahlblom, M.Sc. (Econ. ), is Managing Director of Paroc Group Oy, one of Europe’s leading manufacturers of energy-efficient and fire-proof insulation solutions. He joined Paroc in 2002 and served as CFO in 2006-2018 before he was appointed Managing Director in January 2018. 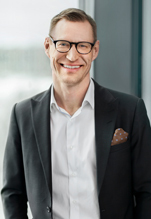 “We are very pleased to have Anders joining the Board of Nordkalk. He complements our Board in an excellent way due to his experience from Paroc, which is highly relevant in light of Nordkalk’s strategy and operational priorities going forward”. Nordkalk is the leading company providing limestone-based products and solutions in Northern Europe, serving customers across several industries including pulp & paper, construction, metals & mining, and chemicals, as well as in environment care and agriculture. Nordkalk employs some 1,000 persons, and in 2017 its turnover amounted to EUR 304 million. All Board members other than those representing Rettig Group are considered to be independent of the company and of its shareholders.